Above: "The Banquet in the Pine Forest" (1482/3) is the third painting in Sandro Botticelli's series "The Story of Nastagio degli Onesti", which illustrates events from Decameron's Eighth Story of the Fifth Day. As Italy commemorates the 700th anniversary of the birth of 14th-century Italian writer Giovanni Boccaccio, Carol King examines why he is important. Italy is celebrating the 700th anniversary of the birth of author and poet, Giovanni Boccaccio, who is best known for his allegory, ‘The Decameron’, written between c. 1349 and c. 1353. The bawdy, comic epic tells the stories of 10 Florentines who take refuge in a countryside villa for a few weeks while the Black Death ravage their city during the mid-14th century. To pass the time, Boccaccio’s characters swap tales of love, lust, greed, passion and adventure over 10 evenings. His vivid account of medieval life, realistic dialogue and entertaining narrative appealed to contemporary readers; his portrayal of sentiments and observations on human nature are timeless. Among the many festivities to honour Boccaccio, the Tuscan town of Certaldo is holding an event retelling his life along with recreations of scenes from his most famous works performed by people in costumes. Certaldo is thought to be Boccaccio’s birthplace and locals will look to mark the poet’s fame with dances, processions and recitations of his works during the weekend of 14 to 15 September 2013. The Società Dante Alighieri (Dante Alighieri Society) has also launched an initiative to mark the anniversary. It is asking people to tweet retellings of the stories of ‘The Decameron’. The project ends in November and the 10 best tweets will win prizes at an event scheduled for the end of 2013. The move to feature the work of a medieval writer on social media illustrates just how Boccaccio’s earthy tales still have relevance. 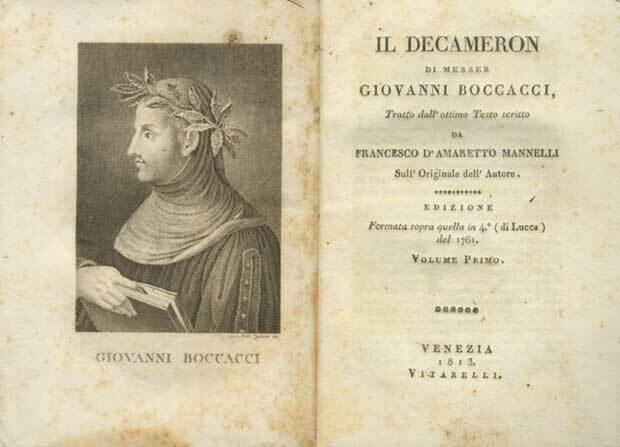 However, Boccaccio is remembered for more than ‘The Decameron’. Other influential works include ‘Elegy of Madonna Fiammetta’, which has been described as the “first modern psychological novel”, the narrative poem ‘Il Filostrato’, and a series of biographies on famous men and women intended as moralistic guides. An important and previously unknown manuscript titled 'De Casibus', a collection of biographies of famous figures from history, was recently found at England’s University of Manchester. Boccaccio’s work inspired writers beyond Italian shores, too, notably the so-called “father of English literature”, poet Geoffrey Chaucer, who authored ‘The Canterbury Tales’ at the end of the 14th century. Academics have suggested that Chaucer may have met Boccaccio and his friend and fellow poet, Petrarch, in 1373 when he visited Italy. The Italians are thought to have introduced Chaucer to medieval Italian poetry and later he adapted its forms and stories into poems such as ‘Troilus and Criseyde’ written c. 1380. Boccaccio was also more than a writer, and together with Petrarch, helped lay the foundation for humanism in the Renaissance. Boccaccio was born in 1313, most likely in Certaldo or possibly in Florence, although it has been suggested he may have been born in Paris. He was the illegitimate son of a prosperous Florentine merchant banker, who deserted Boccaccio’s mother. In 1327, Boccaccio moved to Naples with his father, where he was expected to follow his father’s example and become an apprentice merchant banker. When Boccaccio showed no aptitude for banking, he went to study canon law. It was in the city that Boccaccio found his true vocation: poetry. He pursued his literary studies in Naples, which was then one of Europe’s most important cultural and intellectual centres. 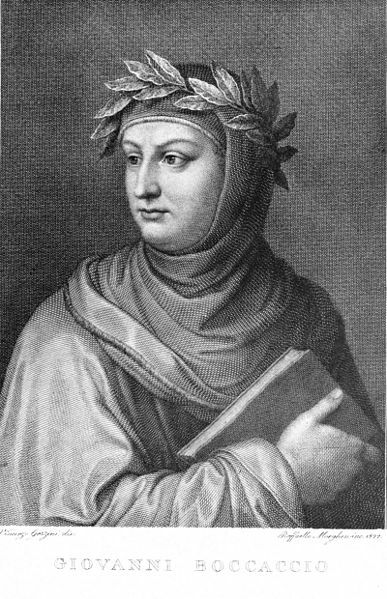 Boccaccio was forced to return to Florence in 1341 because of the tense political relations between Naples and Florence. He was in Florence in 1348, when some 75% of the population died from the Black Death, and he recounted his experience of the pandemic that decimated its citizens in ‘The Decameron’. By 1350, Boccaccio had become more involved with humanism and was regarded as a man of letters. Such was his reputation for persuasion, the Florentine government entrusted him with several diplomatic missions within Italy, as well as to France and Germany. The same year, he met Petrarch, who encouraged him to study ancient Greek and Roman literature. At that time, many regarded the ancient texts as pagan and clerics were concerned they might harm Christian readers. Boccaccio became an advocate of the merits and importance of classical literature, helping to pave the way for ideas that became prominent during the Renaissance. After a failed coup in 1361, Boccaccio became less involved with the Florentine government and moved to Certaldo, where he spent the rest of his life. His later years were troubled by illness and it is thought he had congestive heart failure. Boccaccio died in 1375 and is buried in Certaldo.